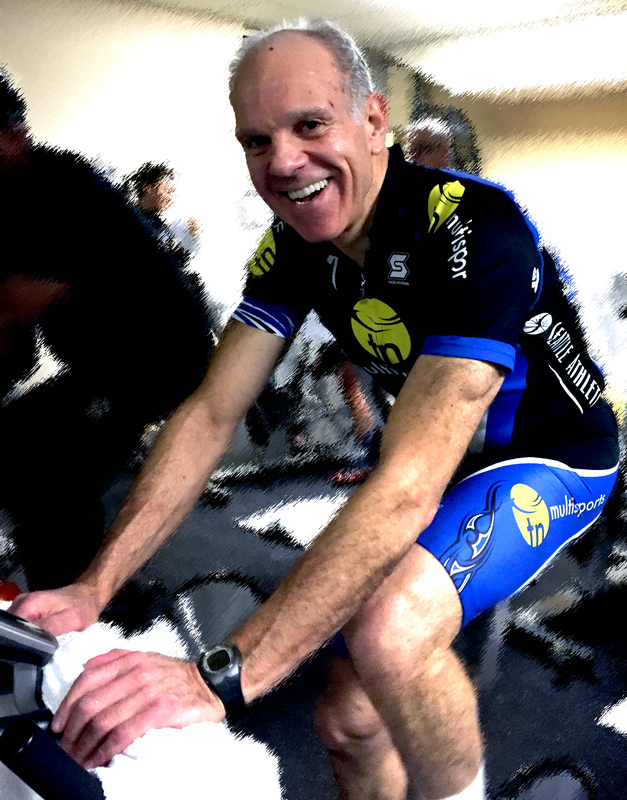 Gary Trabolsi is our inspirational member of the month. He joined the club in 1984 and has never looked back. He strives to achieve more while balancing life with work and family. At the club he participates in swimming, spin classes and the strength training. He displays determination and a willingness to succeed regularly. While doing a half ironman triathlon, he couldn’t find his “running” shoes so ran the entire 13.1 mile in his cycling shoes. Most have trouble walking from the cycle room to the locker room. He participated in triathlons up until hip surgery in 2008. Since then, he continues to do epic ride adventures around the state. He had a set-back last year when he fractured his knee cap late-August during a training ride. Although there was healing and recovery time, he still never missed a bit with his training. He was smart in building his training back up and displayed patience with grace and is back doing what he loves! His lineup for 2015 included STP, Ramrod and the High Pass Challenge. With all this training you are bound to see him at the café grabbing his favorite post workout snack of yogurt and fresh fruit. Over the years Gary has fallen in love with the SAC, primarily for its friendly members and supportive and knowledgeable staff. He suggest that anyone wanted to start building up fitness to seek guidance from a professional trainer and make sure it is “do-able and fun”. By sticking with a plan you will see changes in the mind and body. Once settled into a routine, he suggests, then to try new things and step outside your comfort zone, to keep things interesting and fun. Gary participates in all he does because he loves challenging his body and heart, and it shows. And ultimately, that is why he has been chosen as SAC inspirational member of the month. 1. Motivation – Yes, motivation ceases in less than desirable weather. To keep your motivation strong, it’s always a good idea to make yourself accountable. Making plans to run with a friend or a running group will be your saving grace. When someone else is expecting you, it’s less likely you will bail on your run! 2. Winter Apparel – I say this all the time, IT’S ALL ABOUT THE GEAR! Having key pieces of clothing to cover the body, is imperative to staying comfortable and warm during a cold day’s run. Fabric that is moisture wicking, wind or waterproof, have thermal lining or breath thermo technology is an advantage. Apparel has made major advancements over the last decade and it’s more than worth the money! Look for items made specifically for running, you want those specific features in the garment that assist run motion and enhance your cold weather run experience. 3. Layering – Keeping most of the exposed areas of the body covered is just as important as having the right gear. The less body surface area exposed, the more heat we preserve. Headwear that covers the head and ears is important because the head is 5 times more sensitive to changes in temperature. In extreme cold temperatures, consider a neck warmer or neck muff. Dress in layers, you can peel off a layer if you overheat. It’s typical to wear a base layer, insulating layer and outer layer during a cold weather run, however it really does depend on what is comfortable for the individual. Consider thermal running pants or tights; no need for bulky long johns. Remember, you do need to move! Lastly, wear thicker run socks. They are likely to be moisture wicking and warmer. Remember, running shoes are made to release heat generated from the feet. You want your feet to stay warm as possible. If it’s particularly a snowy or rainy day; consider wearing a Gore-Tex upper running shoe. They not only warmer but waterproof. (Yes, people…they do exist!) Running gloves will be your best friend. Fingers and toes are the first to frostbite, so it’s essential that we make them as warm as possible. Gloves that have enough warmth, moisture wicking with texting fingers is important (that way you never need to remove them just before or after a run). You may want to layer your gloves with a liner inside a pair of thermal run gloves in extreme temperatures. 4. Do your Warm-up Exercises Inside – It’s best to do your warm-up indoor, enough to get the blood moving without a heavy sweat. That way, transitioning outside doesn’t feel so cool and you avoid injuries. 5. Think Maintenance Not Speed – winter or cold weather running is not about speed. Colder temperatures impact your pace per mile in several ways; the nervous system naturally reduces muscle contractions, therefore slowing pace. The body becomes less efficient in both fuel source and oxygen production, depleting your reserves quicker. It is also true, that more energy is required to maintain your core body temperature resulting is less energy available for performance. Don’t expect to be fast, the point is to maintain your conditioning. 6. Hydration – During the winter months, dehydration becomes a more serious risk. An increase of fluid loss occurs due to heating incoming respiration, an increase in urine production due to cold stress and sweating. It is more important to hydrate before, during and after a cold run. 7. Safety First – Most cold weather days are grey and cloudy. Be sure you are highly visible in reflective gear or bright colors. Run surfaces can become icy, slippery or snowy, therefore take precautions to slow down and sharpen your focus with each step to avoid falling. Know the signs of frostbite and hypothermia, just in case. 8. Check the Temperature – Let’s face it, if it’s greater than -10 degrees F, you don’t have to be a hero. Seek an alternative exercise such as indoor cross-training or treadmill/indoor track running. For further information on the SAC Run Club or run coaching sessions, please contact Kendra Kainz, NSCA-CPT, RRCA Run Coach Certified, at . Whether you are preparing for a 5K, a half marathon, or the Army Physical Fitness Test, the road to improving your cardiovascular performance is relatively straightforward. There are many aspects of cardiovascular training that are often ignored and/or overlooked, but with the right approach you can avoid injury and become the runner that you always hoped to (or never thought you could) be. The mental aspect of running can be the most challenging hurdle to overcome. Despite what you may have heard, the human body is built to run. Yes, this includes yours. It may feel like your body is not well prepared for running, and admittedly some of us do have more of a mechanical advantage than others, however that said, with the exception of those with permanent disability we all have the potential to become very successful runners. Physically we are capable of much more than we give ourselves credit for, and when you begin to run your mind will play tricks on you. Your head will be filled with frequent suggestions to slow down, alarms telling you that you are breathing too hard, and a voice devilishly reminding you that you can always head back a little early. I have found that the best way to overcome your running-averse inner voice is distraction. Find something interesting to do and take your mind off of the desire to quit. Try listening to music or podcasts, finding a beautiful outdoor route and focusing on the scenery, or even counting breaths and steps to make the time pass more quickly. Anything to keep your mind off of the desire to quit! Foot strike. Your foot should land lightly and in a relatively neutral position when it strikes the ground. Avoid landing primarily on your heel or your toe. Also if you can hear your foot slapping against the ground you are wasting energy and causing undue wear and tear on your joints. Leg stride. Avoid bounding, as it is also a waste of energy. Your goal should be to move completely rectilinearly, and to spend no energy traveling up away from the ground or absorbing the impact of a dramatic downward descent. Also try to take long, smooth strides. Lengthening your stride is a great way to improve the efficiency of your run as it will ultimately take fewer steps to arrive at your destination. Hips. Positioning your hips can be pretty subtle, so you may need some help from a friend or the mirror. Running with dramatic posterior pelvic tilt (sticking your booty out) slows you down and can create hip and/or low back pain as you progress. Instead try and keep your hips directly underneath your shoulders by tilting them forward. Core. Another subtle point, one for which the mirror will be of no assistance. The importance of maintaining a strong core cannot be understated, although it is often ignored because it can be difficult to explain. For runners, good core position begins from the deep support musculature near your spine. You can practice maintaining a tight core by standing, contracting your pelvic floor, imagining a rope connecting your hips and your neck and pulling it straight up (to engage your multifidi) while also pulling your belly button in toward your low back (to engage your transversus abdominus). This should feel markedly different from “flexing your abs”, and while it is a lot to think about it is worth the practice as it will pay dividends down the road. Upper body posture. Keep your shoulders back as well as your shoulder blades seated to help lessen the intra-abdominal pressure on your lungs and make it easier for you to breathe. Lungs. Breathing is obviously critical to successful cardiovascular performance, but let me assure you that you can relax. You have enough oxygen and you will never run out. In fact, we are swimming in more oxygen than one would ever need to facilitate a cardiovascular workout. The limiting factor regarding oxygen is our body’s ability to utilize it effectively, not a lack of supply. Maximizing oxygen utilization comes from training, not from rapid breathing. All of that said, it is important to maintain a relaxed, rhythmic breathing pattern. The side aches that plague us arise for a variety or reasons, the most common of which is arhythmic diaphragmatic contraction (chaotic breathing). Take slow, deep, and even breaths throughout your run. Arm swing. Do not pump your arms. Pumping your arms is a critical aspect of rapid sprinting, but it will do little more than waste energy during a long run. Instead relax your elbows and wrists, and try to minimize their swing. Also take care to swing your arms in the sagittal plane (straight forward along your sides). Swinging your arms across your body lessens your ability to move rectilinearly and is inefficient. Head position. Hold your head high, directly over your shoulders to avoid neck stress and assist with good torso posture. Look straight ahead, but below the horizon. This will help assist with your rhythmic breathing and keep you moving forward safely without distraction. So now you know how to run! Time to discuss the finer points of program design. Let’s take a look at how to decide where to start and also how to manage your workouts. Selecting your start point is a very important aspect of making a successful running program. While we are all built to run, that does not necessarily imply that you have the ability to tie your shoes and go for a five-mile run this very moment. If you run too much or too fast without giving your body time to adapt injury is inevitable. For some, the best way to start preparing your body to run may be to begin walking on a regular basis. For some others, you may be ready to run but not prepared to go very far or very fast. Start off by running no faster or farther than you can handle, and focus on making cardiovascular exercise part of your regular routine. Once you are running consistently (at least three times per week without fail) then begin to work on increasing the volume and intensity of your workouts, but not before. We also need to discuss the three big variables to consider when planning your runs: intensity, duration, and distance. Intensity can be measured in a variety of ways, the most common of which is via heart rate. For textbook cardiovascular improvement you need to keep your heart rate elevated at a level of 65% to 85% of your maximum heart rate throughout your workout. Measuring your heart rate throughout your workout can be difficult, and as such likely requires a heart rate monitor. Since not everyone has access to the equipment required I will leave it at that. If you want more information about how to use your heart rate monitor or calculate your maximum heart rate please email me (dkrantz@sacdt.com). For the rest of us, intensity can be measured on the Rating of Perceived Exertion (RPE) scale and with some commonsense. Using the RPE scale of 0-10, where 0 is no standing still and 10 is sprinting for your life; you should be working out between the levels 6 and 8. You can also measure intensity by paying attention to your breathing. During your workout you should be breathing hard enough to prevent you from maintaining a conversation, but you should not feel like you cannot catch your breath. Duration and distance are both ways to measure the volume of your workout, and you should incorporate training that focuses on each. Some of your runs should be all about distance (e.g. running two miles as fast as possible), and some should be all about duration (e.g. running for 60 minutes). Incorporating runs that approach volume from each perspective will help you see steady improvement and avoid boredom. One of the biggest mistakes runners make in training is to train at the same intensity all of the time. To see improvement in your running performance it is important to vary your workouts. For example, if you are running three times per week and you can comfortably run two miles, it would be appropriate to plan three different runs: one one-mile workout at an RPE of 8, one 2-mile workout at an RPE of 7, and one three-mile workout at an RPE of 6. Once you are performing cardiovascular exercise regularly and you have a handle on how to approach the requisite intensity, distance, and duration of your runs, it is time to think about progression. Appropriate cardiovascular progression is approximately 10 percent per week. I recommend you round to the nearest tenth-mile for ease of execution. It is important to differentiate between increasing your workouts via percentage of distance and increasing via an absolute amount of distance. Using the example of three runs per week from before, an example of 10% progression is illustrated in the table below. To prevent overtraining and give your body time to adapt to new levels of volume it is most effective to increase your volume in an undulating fashion, illustrated in the table below. Pace yourself. While interval training can be an effective way to improve your speed, add variety to your workout, and break through those pesky plateaus, varying your speed during competition will burn you out during longer runs and ultimately reduce your performance. Instead try and set one brisk pace for your events – you will do much better. Warm up. Always warm up before you run, especially before you compete! Conduct dynamic movements like lunges and deep knee bends, and jog around a bit. Never conduct static stretching prior to a run, it reduces the ability of your muscles to produce force and increases your propensity for injury by creating micro-tears in your muscle fibers. Treadmill running. Treadmills are great tools, particularly when the weather is bad! However they create an artificially perfect running environment, which can be misleading. If you regularly train on the treadmill but conduct your test outdoors you may be disappointed with your performance. In order to mitigate the impact of the treadmill on your competition performance always run at a minimum of a 1% grade. Supporting activities. Although improving your run is best accomplished by running, resistance training and flexibility work will help you avoid injury and dramatically improve your performance. Resistance training (e.g. lifting weights) helps keep your joints strong, promote muscular balance, and makes you a more efficient runner as lean body tissue takes less energy to move around. Flexibility work (e.g. static stretching, yoga) will help improve your active range of motion and in turn increase your stride length, also improving your efficiency. With the aforementioned approach and some dedication coupled with hard work nearly anyone can call themselves a runner. With all the great weather on the way I’m sure you are looking to the outdoors to start some adventures; perhaps even looking at getting some new shoes. Then you go to the store and see the huge athletic shoe selection and go, “now what?” Well here are some helpful tips on what makes shoes different. The running surface you are going to use will determine the kind of shoe you need…if it’s a hard/irregular surface you usually need more support and energy absorption. Look to get the shoe comfortably snug with little to no heal slip. The space between your longest toe and the tip of your shoe should be about a finger width…this is because when you put your body weight into one foot (like when you walk or run) your foot lengthens and need room in the shoe. Most running shoes come with “stock” insoles. If your feet need babying, get a different insole and it may make your outdoor adventures more comfortable. These are the beefed up heavy looking running shoes; they have aggressive outsoles for traction and fortification usually offering higher ankle support, offering support and sole protection from trail obstacles. Use these shoes if you think you will encounter roots, rocks, mud and animal holes during a run or walk. These shoes are the simplified version of the trail-runner. They are designed for pavement or the occasional trip to a wood chipped running track or groomed nature trail. They are usually light and flexible, made to cushion and stabilize your feet during your stride on hard, even surfaces. Pronation involves the natural inward rolling of the foot following the heel strike. The basic pronation will help to absorb impact, relieving pressure on the knees and joints. It is a normal trait of neutral, biomechanically efficient runners. Overpronation involves an exaggerated inward rolling of the foot. This common trait can leave runners with knee pains and sometimes injury. Supination involves the outward rolling of the foot, resulting in insufficient impact reduction at landing. This is not a common running trait. Cushioning in shoes provide an elevated shock absorption with minimal arch support; and are great for runners with light pronation or supination. Cushioning can also be used for those neutral runners who go off-pavement more often (it give runners more variety, keeping them from getting repetitive motion injuries). Stability in shoes helps decelerate basic pronation. These shoes are great for neutral runners or ones who have mild to moderate overpronation, and often utilize a “post” in the midsole. Motion Control in shoes offers stiffer heels and a straighter design to counter overpronation. These are great for runners who exhibit moderate to severe overpronation. Synthetic Leather is a supple, durable, abrasion-resistant material made from nylon and polyester. It is lighter, quick to dry and breathable, requiring no “break-in” time. Nylon and Nylon Mesh are durable synthetic materials used to reduce weight and increase breathability. TPU (thermoplastic polyurethane) overlays are small, abrasion-resisting additions used to enhance stability and durability. EVA (ethylene vinyl acetate) is foam found in running shoes. Cushioning shoes often use just one layer of EVA, or multiple layers if trying to force a flex pattern. Posts are areas of firmer EVA needed to create sections of the midsole that are harder to compress. Often seen in stability shoes, they are used to decelerate pronation or boost durability. Medial posts reinforce the arch side of the midsole for those runners with overpronation. Plates are thin, flexible material (nylon or TPU) that stiffens the forefoot of the shoe; and are often used in trail-runners to protect the bottom of the foot from impact with trail obstacles. Shanks stiffen the midsole and protect the heel and arch. They boost the shoe’s firmness needed in rocky terrain. TPU (thermoplastic polyurethane) is a flexible plastic used in some midsoles for added stability. Now that you know about shoes and how they can be used for your body and exercise adventures, go get a pair and enjoy everything that Seattle has to offer. Look to utilize them with upcoming SAC hikes, mountain expeditions, trail running as well as the Run club every week. For more information on shoes and any outdoor adventure going on please feel free to contact Fitness Director Jacob Galloway or Outdoor Adventure Coach Brandyn Roark and Thomas Eagen.